While editing a story for the Hidden City Daily on a recent weekday morning at the Last Drop Coffee House, I ran into photographer/champion for social change Zoe Strauss and art consultant/former director of the RDA’s Percent for Art program Susan Miller Davis. As I sat down with a refill, the gentleman next to me struck up a conversation about writing and the arts. Turns out Wesley Parrott knows a little about both. 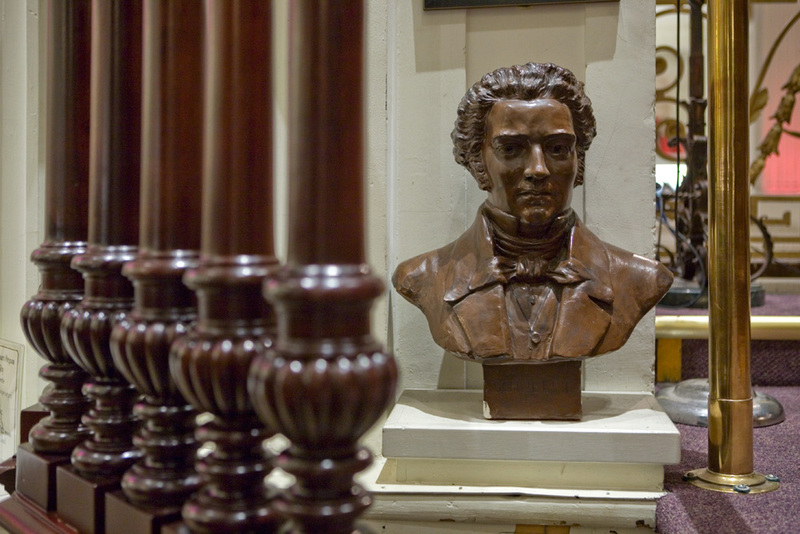 As its former president, Wesley oversaw the Franklin Inn Club, which has called Camac Street home for over 100 years. For years, it was a literary-centered club whose membership required publication of a book, but more recently the range has expanded to include visual arts, science, and other learned disciplines. Its historical roll call includes Bertram Lippincott, Owen Wister, and N.C. Wyeth among the Innmates. 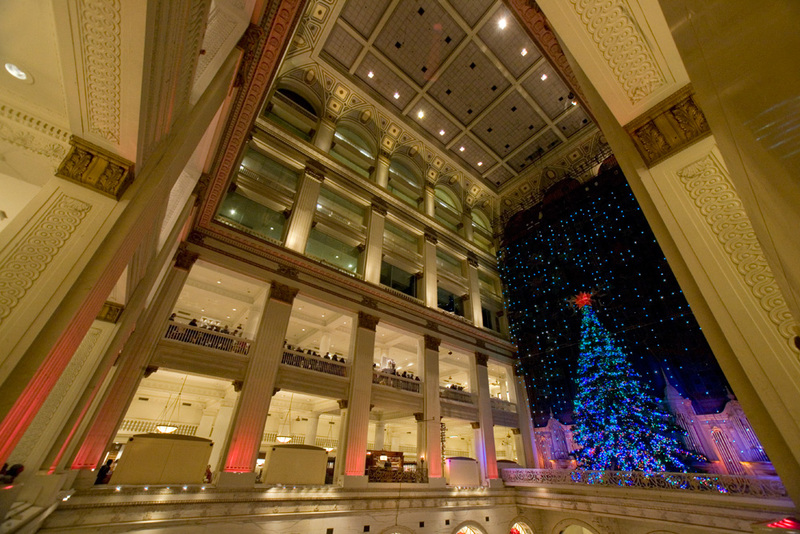 As a student at the Curtis Institute of Music in the 1960s, the young organist Wesley Parrott was taken by Philadelphia—especially by the famous pipe organ at the John Wanamaker store, now Macy’s. 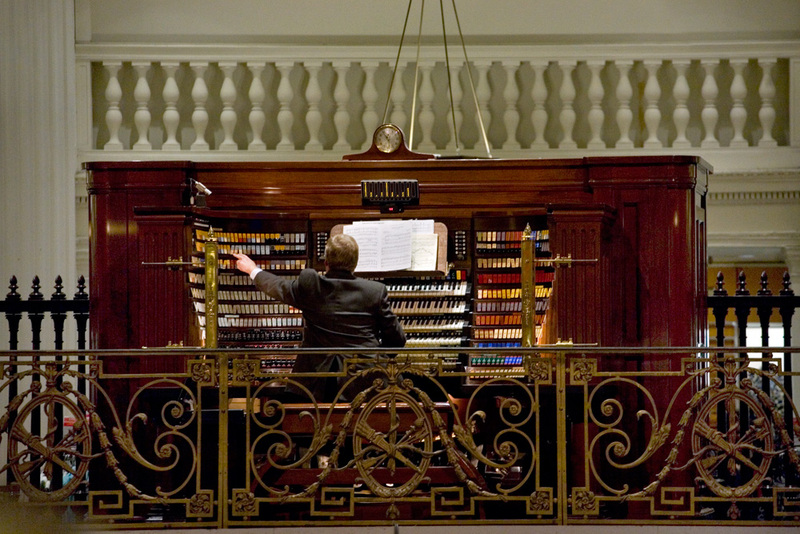 Grand Court Organist Peter Conte—only the fourth person to hold that title in the 102 years since the organ was installed by Rodman Wanamaker, John’s son—coordinates the schedules that allow various organists to perform on the instrument, the largest of its kind in the world. 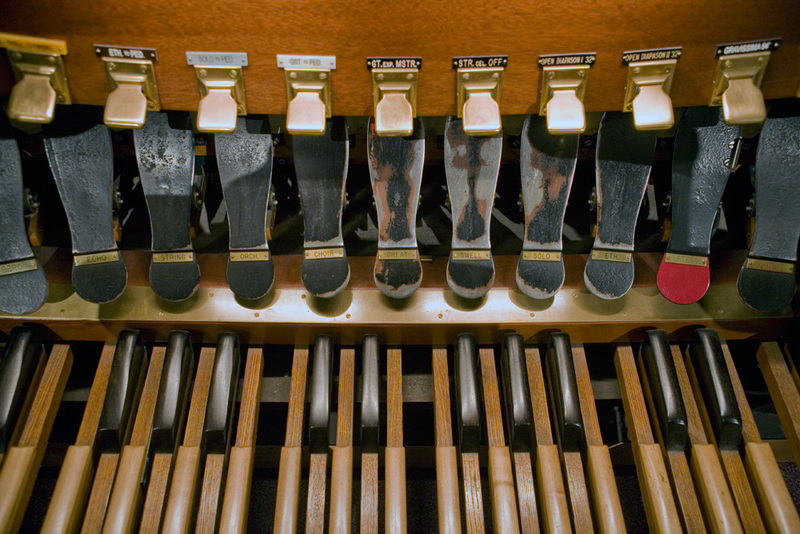 I won’t profess to know much about pipe organs, but I know a good groove when I hear it. 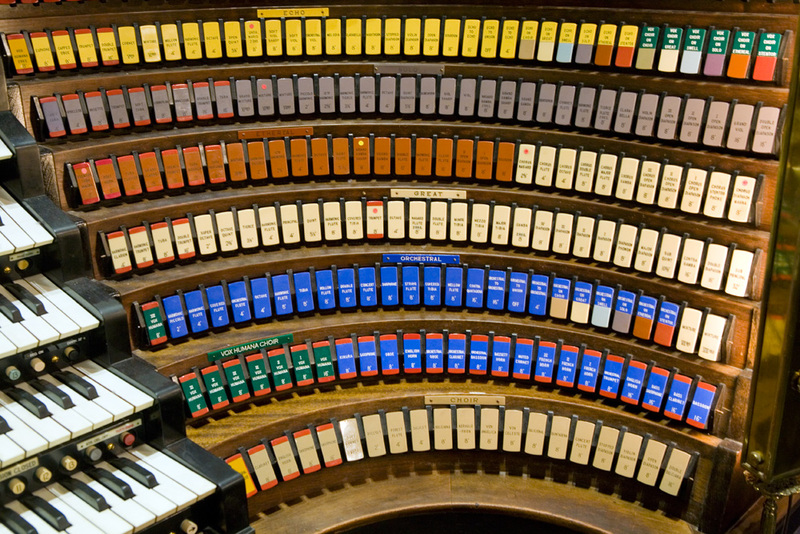 Two Saturdays ago, I felt such a groove—literally, you can feel the music because the organ is loud— as Wesley’s guest at the Wanamaker Organ. With hundreds of onlookers gathered around the eagle below and from the balconies in the departments above, he accompanied the Christmas light show, crescendoing with “O Tannenbaum,” to much applause. The light show runs through December 31st every two hours from 10AM to 8PM. 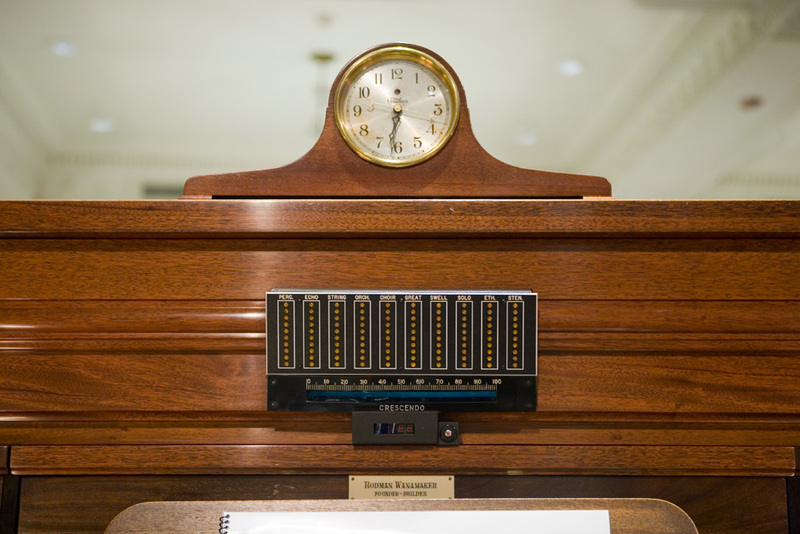 But the 45-minute organ recitals, some of which accompany the light display, are every day, year-round. 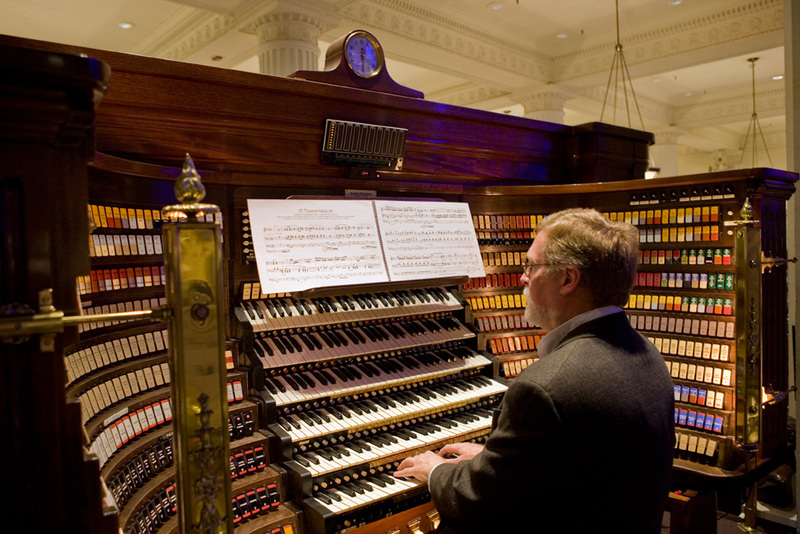 Learn more about the history of the Wanamaker Organ and check the schedule HERE. 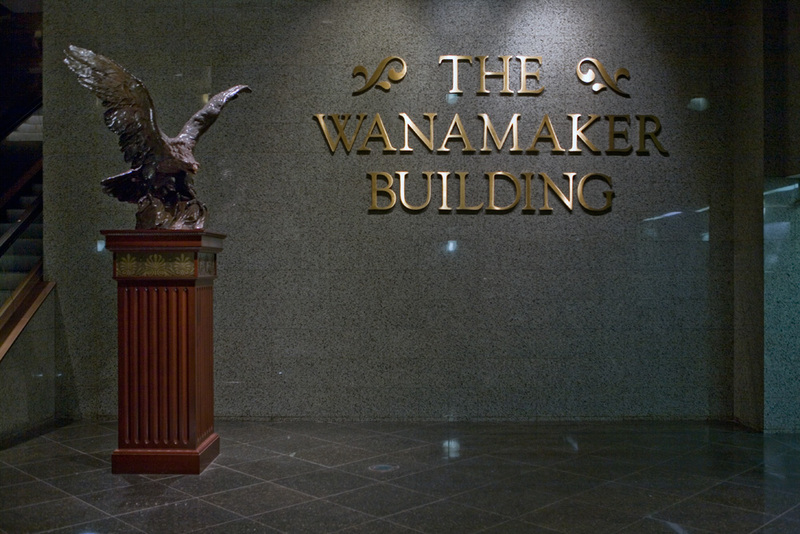 For an extensive history on the Wanamaker Building, check out Shadowbat’s feature for Hidden City HERE. These photos were taken Saturday, December 7th. Click any photo to launch the gallery. One of the most beautiful things to see in Philadelphia in addition to sampling the requisite soft pretzel and the cheese steak plus walk or run up the Art Museum steps, Rocky Style. 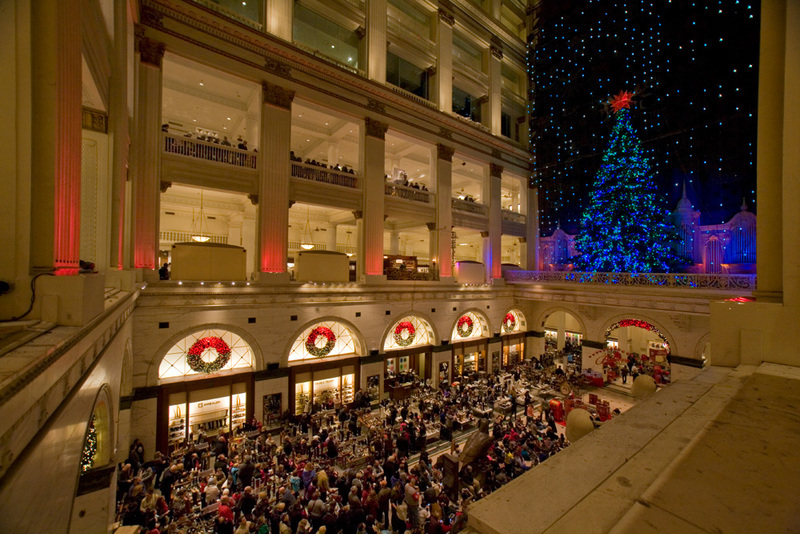 That is the Christmas Pageant of Lights in the formerly called Wanamaker store. NO matter what it is called now, it will always be the Wanamaker. 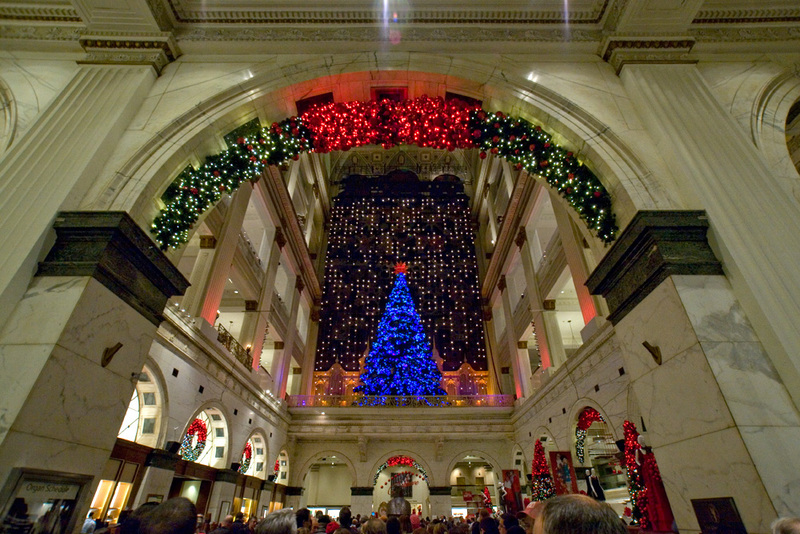 We all grew up in Philly watching Sally Starr, enjoying the Three Stooges, soft pretzels, Phillies, Eagles, Flyer games and our parents always took us to see the lights at Wanamaker during Christmas. Visions of gifts received, visits from long dead relatives, memorable family outings all tug at the heart. But we still take our kids to experience what we experienced in our childhood. May the Wanamaker shine on forever. Visited the light show yesterday for the 50th straight year with my nieces and their children. Unfortunately, Macy’s was showing it only ever other hour! This led to the most crowded conditions ever! We tried our regular spots on the 2nd and 3rd floors, and even though we got there 1/2 hour early, we were basically shut out, and all the while, people trying to shop were squeezing by us. It was actually frightening, and I’m glad no one had a panic attack, especially when it was over, and hundreds of people were cramming towards the escalator. Don’t know why Macy’s made that decision, but I would love to know their rationale. This could be a topic of discussion with your local Councilman and this could spark conversation with Macy’s on the frequency of playing the Christmas lights every hour versus every other hour. Perhaps an arts grant from the city/state or local foundation would help defray the cost. 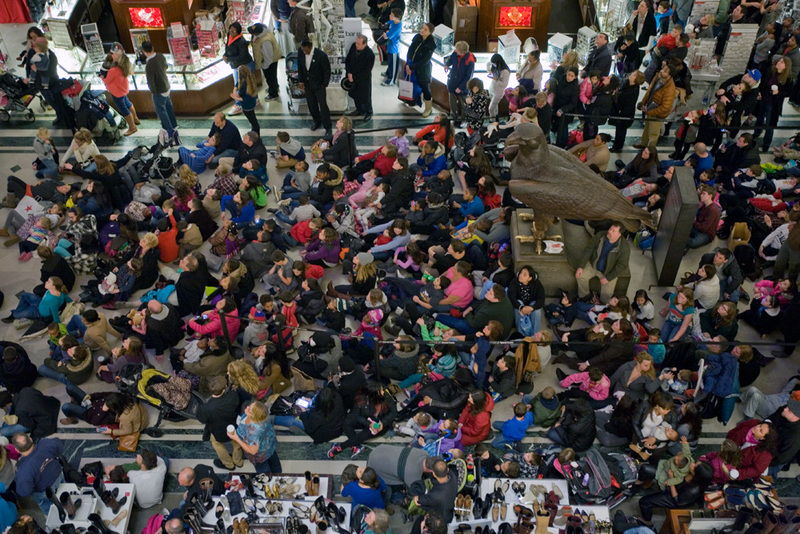 Yes, it is not safe to have a very crowded hall to watch lights show every other hour vice every hour. I’ve seen the organ but I’ve never had the pleasure of hearing it. Hopefully this year I can get the wife into center city and take in the sound. HAPPY NEW YEAR TO ALL !!! 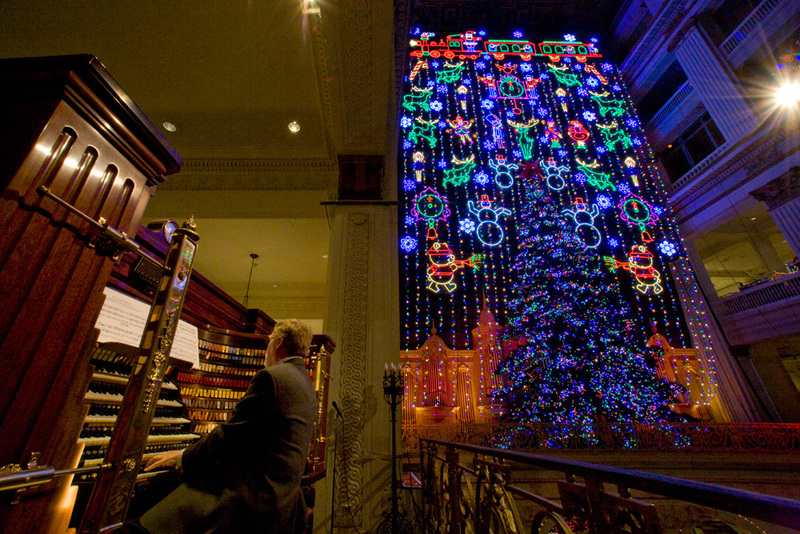 Having been a fan of the Wanamaker organ / holiday light show and the Wanamaker building in general, as well as covering it for my website, I wanted to just say that these are some fabulous photos! I know from personal experience how challenging it can be to capture the grandeur of the building and the moment, and these really give the sense of what it is to be there. Job well done! Thanks, Mod Betty! Nice job on your piece, too.